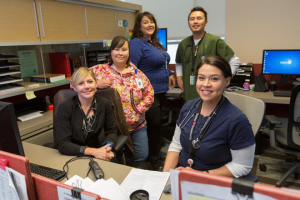 A wide range of health and wellness services are provided to some 51,000 Alaska Native and American Indian people living in the Municipality of Anchorage, Matanuska-Susitna Borough, and nearby villages. SCF also provides health care to an additional 14,000 residents of 55 rural villages in the Anchorage Service Unit, an area stretching 107,400 square miles across Southcentral Alaska – from the Aleutian and Pribilof Islands in the west to the Canadian border. In 1998, SCF established the Village Service Management Team, which serves as a liaison between the organization and tribal representatives from within the ASU. The members advise SCF’s Board of Directors on the health care needs of their villages and help village residents understand services available to them. Behavioral Services, Executive and Tribal Services, Finance, Medical Services, Office of the President, Organizational Development and Innovation and Resource and Development. SCF offers multiple nursing roles. Primary care and pediatric nurses work collaboratively one on one with providers to provide whole-person, population based care in a team based environment. With integrated pharmacists, nutritionists, and behavioral health co-located in the clinics, nurses have multiple resources to provide excellent care coordination and follow up. Nurses at SCF build relationships with their customers as well as their interdisciplinary team members. Whether in an outpatient clinic or other areas of the organization providing care, nurses are a respected member of the team. The Primary Care integrated care teams consist of a Provider, RN Case Manager, Certified Medical Assistant, and Case Management Support staff. This integrated team builds a relationship with customer-owners over time to address their preventive, acute, and chronic healthcare needs which results in a high continuity of care and interdisciplinary teamwork. The RN Case Manager works autonomously making good nursing judgments and having difficult conversation while maintaining positive relationships. RN Case Managers in the Pediatric Clinic work in partnership with their integrated care team to provide care coordination for local pediatric customer-owners. They provide nursing assessment and triage over the phone for parents and guardians. They assist providers in the care and follow up of complex pediatric customer-owners and the needs of their family. They connect customer-owners and their families to resources and specialty services as needed. The pediatric integrated care teams consist of a Provider, RN Case Manager, Certified Medical Assistant, and Case Management Support staff. This integrated team builds a relationship with customer-owners over time to address their preventive, acute, and chronic healthcare needs which results in a high continuity of care and interdisciplinary teamwork. An RN in Fast Track will work in partnership with providers to care for customer-owners presenting to the Emergency Department. These customer-owners will be triaged in the Emergency Department and determined appropriate for the Fast Track. RNs will perform initial and ongoing assessment of customer-owners, carry out provider orders, administer medications and treatments and perform discharge assessment and teaching in an urgent care setting. Home Visitation Team RNs work in partnership with the Primary Care teams to provide in home care for customer-owners throughout the lifespan. They provide nursing assessment, wound care, treatment, education on discharge instructions, medications and chronic conditions. They perform blood draws or administer medications as ordered in close connection to the customer-owners Primary Care team. Pediatric Neurodevelopmental Case Managers work in partnership with the Primary Care and Pediatric Integrated Care Teams to provide care coordination and follow up for local and statewide pediatric customer-owners and their families. They provide nursing assessment and triage over the phone for parents and guardians, assist providers in the care and follow up on complex customer-owners with developmental delays and disabilities, and assist in the coordinated delivery of clinic-based interventional therapies. Services offered include speech, occupational therapy, physical therapy, applied behavior analysis, telehealth, neurodevelopmental specialists and behavioral health services. An RN case manager in OB/GYN will partner with midwives and physicians to deliver obstetric and gynecological care for beneficiaries statewide. Case managers track high risk obstetrical customer-owners throughout their pregnancies and provide education and triage. They provide care coordination for high risk pregnancies and gynecological consultations, pre-operative and post-operative teaching, and perform clinical assessments and interventions as needed. SCF Detox is a short term 16 bed residential medical detox facility which assists customer-owner-owners withdrawing from addictive substances including alcohol and opiates. The RN role entails conducting nursing assessments, health and psychosocial history, orientation to the program and provider consultation. They will do scheduled customer-owner assessments and adjust the plan of care according to the customer-owner needs. Behavioral Services Division (BSD) RNs work in partnership with Psychologists, Psychiatrists and Clinicians to provide outpatient care for customers living with acute and chronic mental health challenges. They provide nursing assessment, treatment, and provision of education on medications and chronic conditions. They perform blood draws or administer medications as ordered in close connection to the customer’s primary care and behavioral health team. Behavioral Health Division RNs work in partnership with the Behavioral Health Providers and Primary Care teams to provide support and treatment for addictions and other co-occurring mental health diagnoses. They provide nursing assessment, medication treatment, education and medical case management. They perform blood draws or administer medications as ordered in close connection to the customer’s Health Care Provider.